Want to learn how to draw loose clothing? 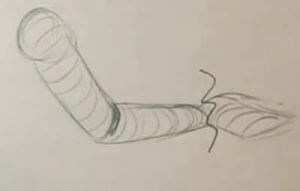 Start off your drawing with strong construction and a good pose. 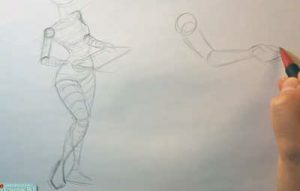 This is known as ‘creating the underlying form’ and it’ll provide you with a strong foundation for your finished pin-up drawing.Even though the final drawing will have clothes on top of the body it’s important to take some time to draw the forms of your character that the clothing is going to rest on top of. Of course, this is also great practice to become more comfortable drawing the body. After you have the basic outline of the character’s pose, take a moment to draw in light lines that follow the surface of the skin. When learning how to draw loose clothing, this will help define the full volume and shape of the character’s limbs. A quick and easy way to find the surface direction of the arm is to follow the curve that flows through the elbow. 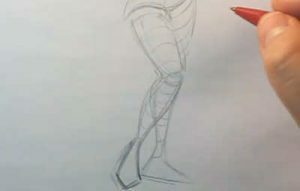 In this example from our how to draw loose clothing video course, you can see that the surface lines for the elbow don’t match up with the surface lines along the hand. But don’t worry. If you find yourself drawing an arm where either the upper and lower arms don’t match surface direction, or the lower arm and hand aren’t matching, you should adjust the surface direction lines so that they are all flowing the same way. And that’s it for our tutorial on how to draw loose clothing. We hope you enjoyed it! Why not leave us some feedback below?